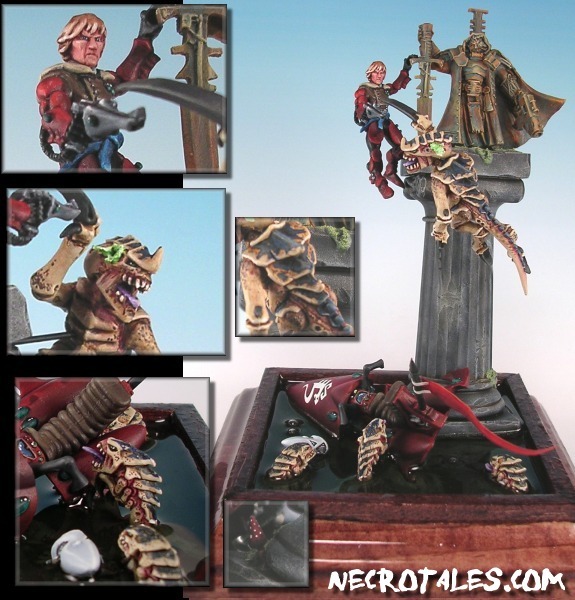 his aptly named section of Necrotales showcases various projects which are too detailed to be relegated to the galleries. Some are award winners, some have really huge bases, and some are just personal favorites. 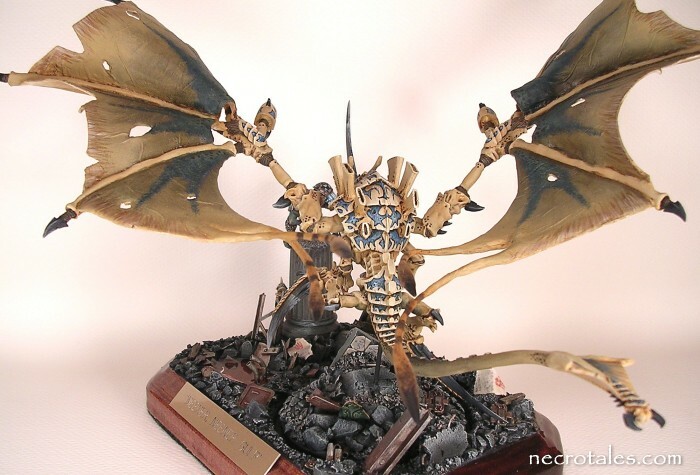 A gold for "Warhammer 40k Large Monster or Vehicle" at Gamesday Atlanta 2006. 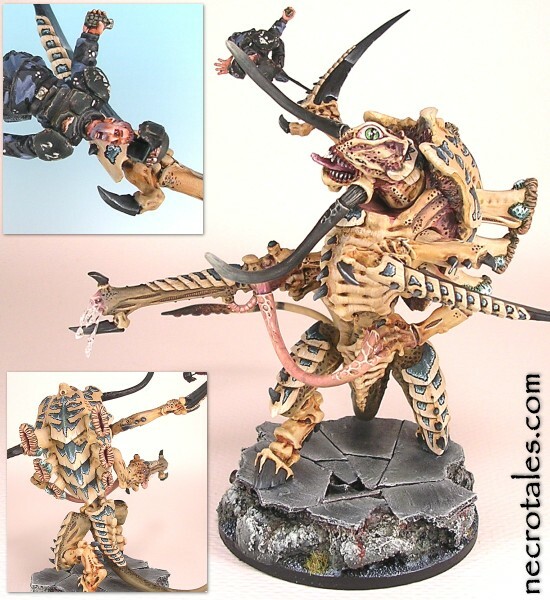 I estimated somewhere around 120 hours worth of work that went into this, counting converting and painting the Hive Tyrant as well as the base. My only regret is that I put the title plaque on the side opposite to the one that is best for viewing the scene. The title was "Neener, Neener, GULP." 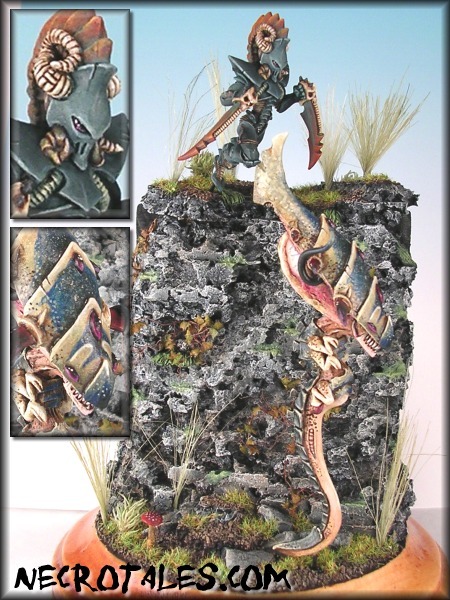 Oh, and the Hive Tyrant is removable from the base. Want to see a larger image from the side, the back, or from head on? This won my first Gold at Gamesday Baltimore 2005 for "Best Duel." It's a fairly complex piece in the sense that the angles of motion all criss-cross one another, making it a good choice for a rotating display case. The title for this was "The Upper Hand." 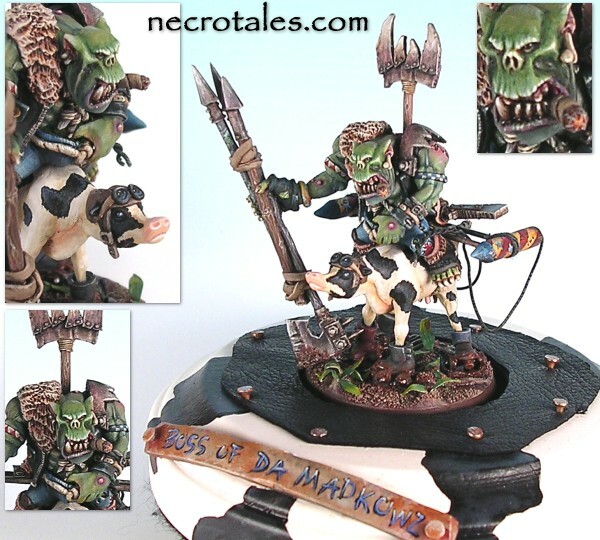 Won a Silver for "Best Warhammer Fantasy Battle Monster or War Machine" at Games Day Atlanta 2005. 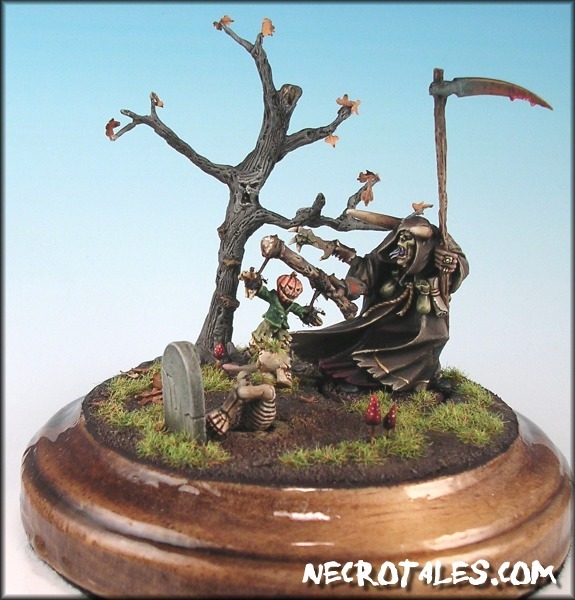 This is an extensive conversion using a Tomb Scorpion body and a Liche Priest, a jeweler's saw, and a fair amount of brown stuff. Want to see a larger image of the front or back? Another bit of a rush job, I hate to admit -- my planned entry wasn't working out (long story), so I put this together mere days before the show. It won Silver for "Best Duel" at Games Day Atlanta 2005. 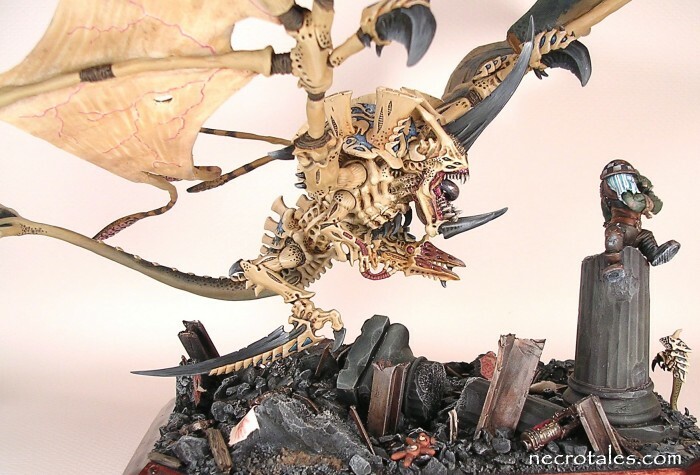 My title for this was "Tyranid - The Other White Meat." 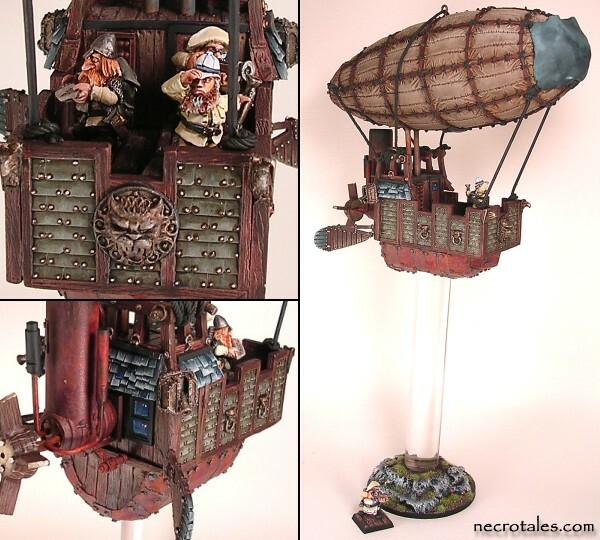 This entry won a Bronze at Games Day Atlanta 2004 for "Best Warhammer Fantasy Battle Regiment." I'd forgotten to plan an entry that year, so the entire project took less than four days between frantically grabbing some zombies off my shelves, stripping and priming them, and then painting them. I was working on the last zombie Friday afternoon before the Saturday Games Day. I had intended to finish this piece in time for Gamesday Atlanta 2005, but I decided to not rush at the last minute like normal. It was ready for Gamesday Baltimore 2005, however, and while it made first cut, it didn't place. No surprise, really, but I was pleased to catch many folks photographing it. I wanted both imposing size and a sense of dynamics for the carnifex, so the addition of an unlucky guardsman flying through the air fit the bill perfectly. 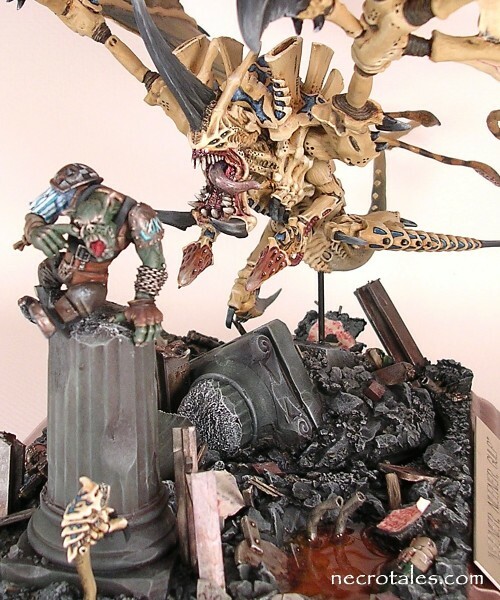 This was an entry in the 40K Large Monster category at Gamesday Atlanta 2007, but failed to place. 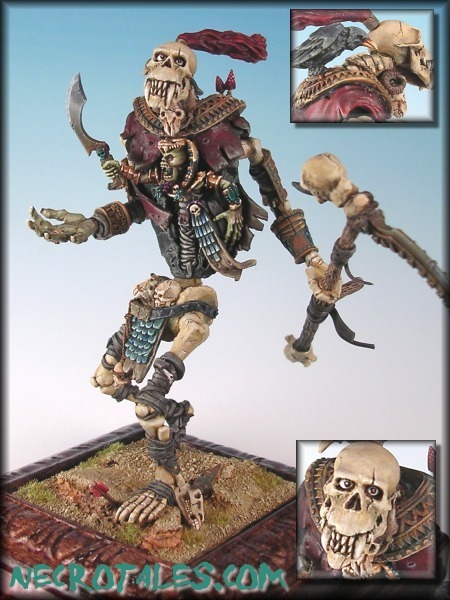 Honestly, I was surprised that this didn't place in the Warhammer 40K Single Figure category at Gamesday Atlanta 2007, and apparently many others were as well. The cow comes from the Warhammer Giant kit, though all the parts are heavily converted. Note the bundle of three spears, "coz one of dem just ain't enuff." Normally I don't do major conversion or scratchbuilds as part of a commission, but the client came to me with an idea that sounded too cool to pass up. 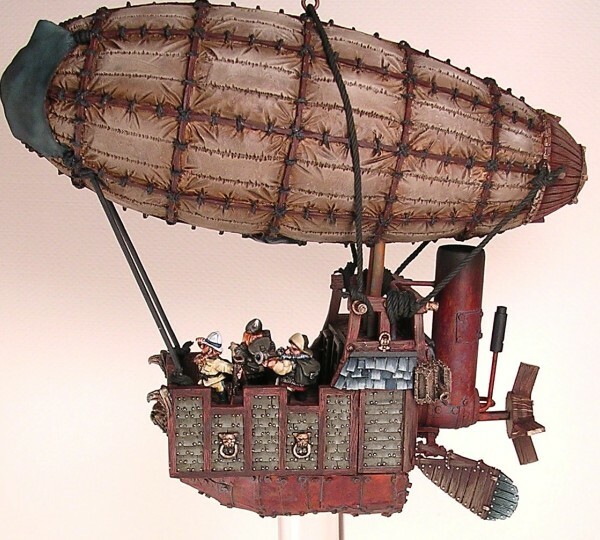 This zeppelin uses the Forgeworld Warmaster zeppelin as the main balloon and parts of the Empire War Wagon as the gondola. 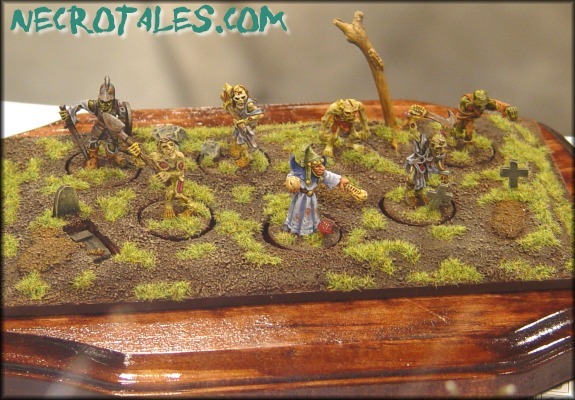 Except for the dwarf crew, the rest is scratchbuilt from wood (both balsa and masonite), cardboard, cord, and greenstuff. In retrospect, I should have done more with the colour scheme, but both I and the client were very pleased with the way it turned out. When mounted on the support, it stands around 12" tall! Want to see a larger composite image or a side shot of the zeppelin?